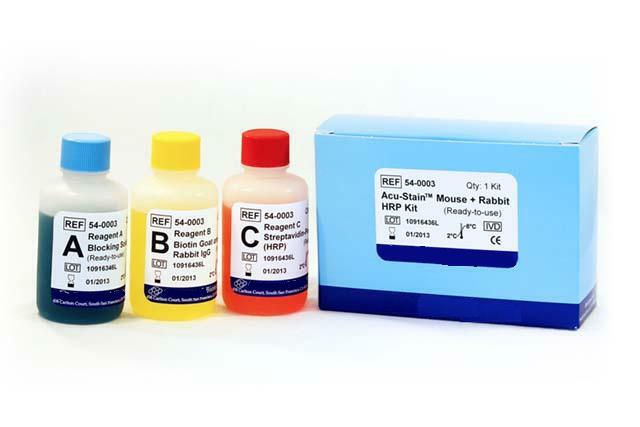 This kit utilizes a biotinlyated secondary antibody to locate where the mouse and/or rabbit primary antibody is bound to the target antigen. Streptavidin-HRP (horseradish peroxidase) is then applied and binds to the secondary antibody. This complex is observed through the use of a substrate-chromogen solution, which when added, results in a colored precipitate at the antigen location. The staining location and pattern is easily observable by light microscopy.